Derry were made to pay for a poor first-half display as Galway edged victory in the Division 2 Football League opener at Salthill. Despite playing against the wind in the first half, Galway hit the opening four scores and still led 0-8 to 0-4 at half-time. Michael Meehan's goal extended Galway's lead to seven but a much-improved Derry fought back to trail by only one. 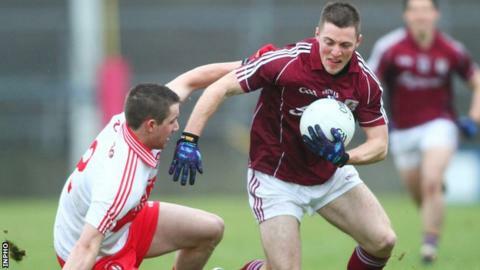 However, Galway regrouped in the closing stages to win by three points. Derry's tactic of withdrawing a number of their forwards to deep positions in the first half backfired badly as Eoin Bradley was left to do far too much on his own. Granted, Bradley did look sharp throughout but it was only after the introduction of experienced men Barry McGoldrick and Gerard O'Kane that Derry began to compete effectively. Michael Martin hit two of Galway's opening four points with the impressive Meehan and Sean Armstrong also on target. PJ McCloskey scored the first of his three scores from play to open Derry's account in the 17th minute but Danny Cummins and Martin responded with more Galway points. Derry looked to be getting a foothold into the contest as McCloskey, Colin Devlin and James Kielt pointed to leave only two between the sides. However, the margin was four again by the break as Meehan notched two more Galway points. Patsy Bradley struck the first score of the second half but Derry looked down and out when Meehan fisted to the net a minute later after a Daniel Martin shot had come back off the woodwork. However, strong running by substitutes O'Kane and Barry McGoldrick helped spur a Derry revival as they hit six of the next seven scores to cut Galway's lead to only a point. Bradley, McGoldrick, Enda Lynn and the impressive Ryan Bell were on the scoresheet during the period of Derry dominance and the Oak Leafers could perhaps even had gone ahead as Lynn had a goal attempt blocked with Bradley off-target with the follow-up. Derry will perhaps point to the controversial Gary O'Donnell score which doubled Galway's lead in the 55th minute after it appeared that Chrissy McKaigue had been fouled. A Lynn point again reduced Galway's lead to the minimum but they couldn't get on terms as two Galway points put daylight between the teams. Derry didn't get closer than two in arrears for the remainder of the contest as Galway held on despite their unconvincing second-half display.